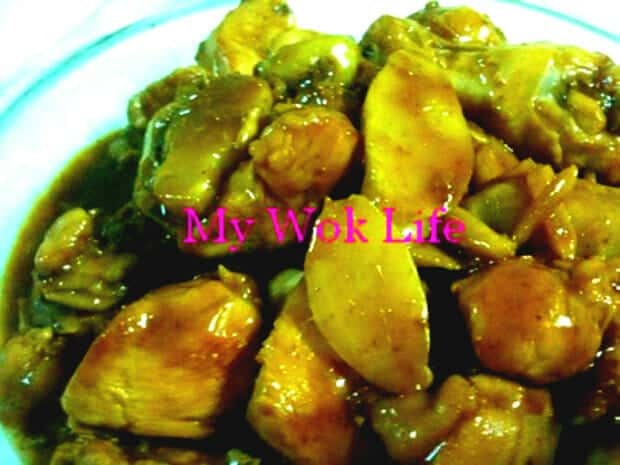 This is one of the many versions of soy-sauced chicken stir-fry, and this is the best I liked among the variations, ever since my first cooking of such with a similar recipe found in the apps of my iPhone..
Not only having chicken as the main ingredient in this dish, the young ginger has also taken the lead here. For both its exotic flavor and eating pleasure. Yes, both the chicken and ginger are the main ingredients for the dish here to be savored on! Afraid of the pungency in the ginger? The step of dredging and pre-sautéed gingers in this recipe is to help creating a more fragrant and crunchy texture that makes it taste so nice without much of its pungency flavor. So, eat the ginger as one of the mains, too. And don’t forget, consumption of ginger helps to expel the excessive gas in the stomach as well as providing warming effect to our body, especially in cold and rainy weather. 1) Rinse chicken and briefly pat dry with kitchen towel. Marinate with the listed seasoning (A), for at least an hour. Then, combine well with sesame oil and potato starch (Seasoning B). 2) Dredge young ginger with generous amount of salt. Set aside to season till ready to cook, and then, rinse away salt and pat dry ginger before cooking. 3) Heat wok without any oil over medium-high fire. Add young ginger in the dry heated wok and stir fry till lightly crunched and fragrant. Remove ginger from wok and set aside. 4) Add oil into the same wok. Brief sauté chicken for 1 minute, or until chicken turns white with trace of browning on the outer. Return ginger to the wok and stir fry to combine well. 5) Drizzle light soy sauce and dark soy sauce. Stir fry to combine. Add some water, if more gravy preferred. Add in rock sugar. Cover wok with lid and reduce heat to low fire to simmer for 20 minutes, or until chicken is well cooked. 6) Increase heat to high fire to cook the sauce till lightly thicken, for about 1 – 2 minutes. Otherwise, you may stir in a small amount of corn starch slurry to help thickening the sauce. A portion of my young ginger chicken stir fry counts about 360kcal. Tips: Drizzle water, if find the ingredients too dry while cooking, but do not add too much of water as some water in the chicken meat will be extracted during the simmering process. I am starting to watch the calories I eat. May I know how do you count the calories in the food you cooked? Is there any website for that? I am using myfitnesspal now but no such function (i think).